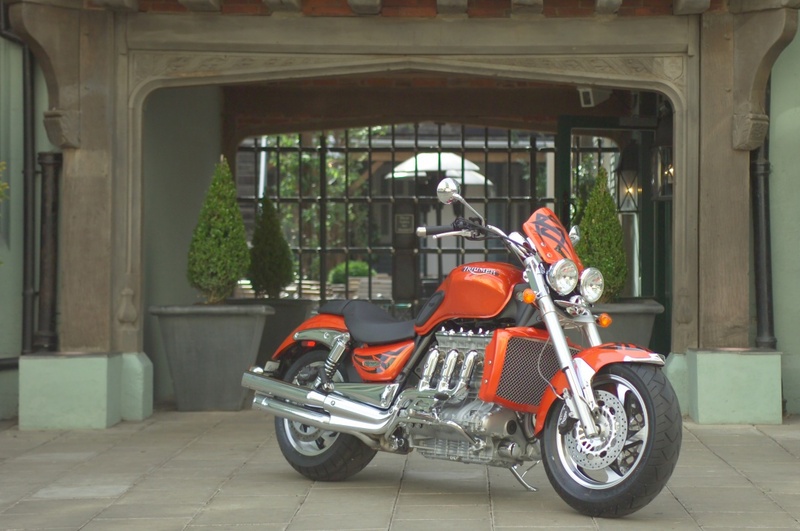 When producing ever-increasing volumes of motorcycles on a daily basis, consistency, speed and quality are vital across the entire manufacturing process. That is why Triumph Motorcycles has incorporated Roemheld (formerly Romheld) hydraulic clamping systems on the latest swing arm fixtures at its new factory in Hinckley, Leicestershire. This new plant, four times the size of the original facility, was built to enable Triumph to increase its production capacity even further to meet demand and continue its growth. Triumph Production Engineer, Chris Sharp, explained: "It's all about maximum speeds and feeds. We use hydraulic clamping across the board as it enables us to ensure consistency, speed and repeatability - all of which are essential for volume production. 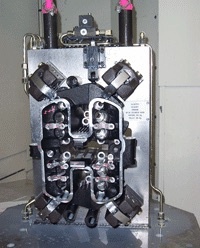 Roemheld has been our recommended hydraulic workholding product for some years now." Triumph continues to enjoy increasing popularity throughout the UK, Europe and America and has doubled its production over the past three years alone. 80% of Triumph motorcycles are destined for the export market and with 12 different models available, Triumph is confident that it has a bike for everyone's needs. Bruno Tagliaferri, Head of Sales for Triumph, said: "Since our rebirth in 1990, we have re-established ourselves as a serious motorcycle manufacturer. Not only in the UK, but also in 30 markets worldwide. We hope to continue to expand our model range in the years to come, building on what we have already achieved. The current build programme is 30,000 motorcycles per year." The key to the manufacturing plant's ability to keep up with demand has been substantial investment in the latest technology and manufacturing techniques. The new factory's first swing arm fixture was installed five years ago by A C Hydraulics. A C Hydraulics continuously works closely with the Triumph production team to develop and install fixtures agreeing the design specifications, producing the circuitry for the fixtures, providing operator training and then undertaking ongoing after sales support. Mark Chapman, Sales and Marketing Director for A C Hydraulics, commented: "The benefit of using Roemheld workholding elements in the fixtures is that, as well as being extremely reliable and low maintenance, there is such a wide range that we rarely have to source special items." The Triumph factory uses two workholding systems palletised for coupling and de-coupling and fixed hydraulic clamping systems. The swing arm fixtures utilise a range of Roemheld block cylinders, swing clamps, work supports and ancillary products. Providing a maximum operating pressure of up to 500 bar, Roemheld hydraulic clamping is used in the machining of both the metal and aluminium sub-components of the frames, in the final machined frame as well as in the machining of camshafts and engine case covers. 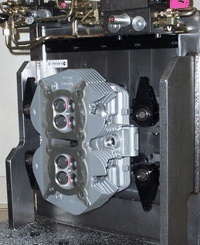 Hydraulic clamping is also used during the final assembly process. Quality is understandably a key manufacturing issue for Triumph and that is why hydraulic clamping is so vital to the production process. As Chris explained: "We have to know that the tolerances are right and that the components cannot move during machining. Even 1/4mm can throw everything out. With the Roemheld components on the fixture, we can check the first output and then run the fixture throughout the day in the knowledge that the rest will be okay. We can also leave the visual pressure indicator on as a useful double check." For increased safety, the five swing arm fixtures at Triumph incorporate static loading and unloading. Preventative maintenance is also vital to the high level of productivity demanded at the plant and this is an area in which Roemheld workholding systems definitely come into their own. Chris Harvey, Triumph Maintenance Supervisor, said: "We have found that the Roemheld products last for years and years - some from the old factory have been running for 10 years. The commonality of parts is also a definite bonus for any maintenance we carry out. In fact, we've only replaced one seal in the last eight months. A C Hydraulics keep the seal kits in stock for us, and they are extremely simple to replace. We have had other hydraulic workholding suppliers, but generally they haven't been as good as Roemheld." Mark Chapman, agreed: "The fact the Roemheld products share a commonality of parts also enables us to hold spare stock for our customers. We deal with a number of fixture builders and it would otherwise be impossible to keep enough parts available at all times." Bill Neal, Managing Director, Roemheld, said: "We find out through A C Hydraulics what Triumph's needs for the future are likely to be, so we can take this into account when developing new hydraulic clamping systems. We in turn, then ensure that A C Hydraulics is kept abreast of our latest technological developments and innovations. So it's a team effort that benefits Triumph while helping us all to advance."